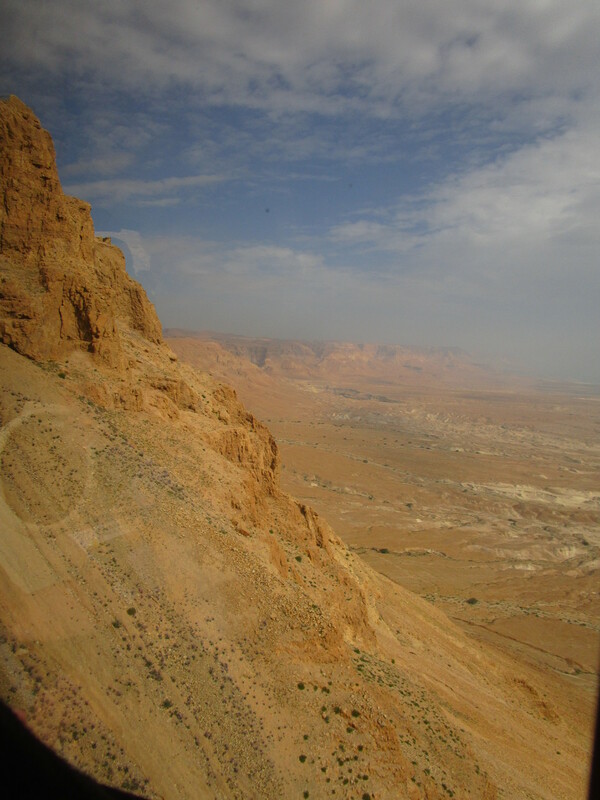 Masada is one of the massive, barren, rocky mountains that rises sharply out of the Judean wilderness. What sets it apart from the others around it are the forbiddingly steep cliff faces along each side and the nearly flat mountaintop. Even I, with my virtually non-existent understanding of battle strategy, can understand how it would be easier to defend from above, when the defender can see those attacking from below. 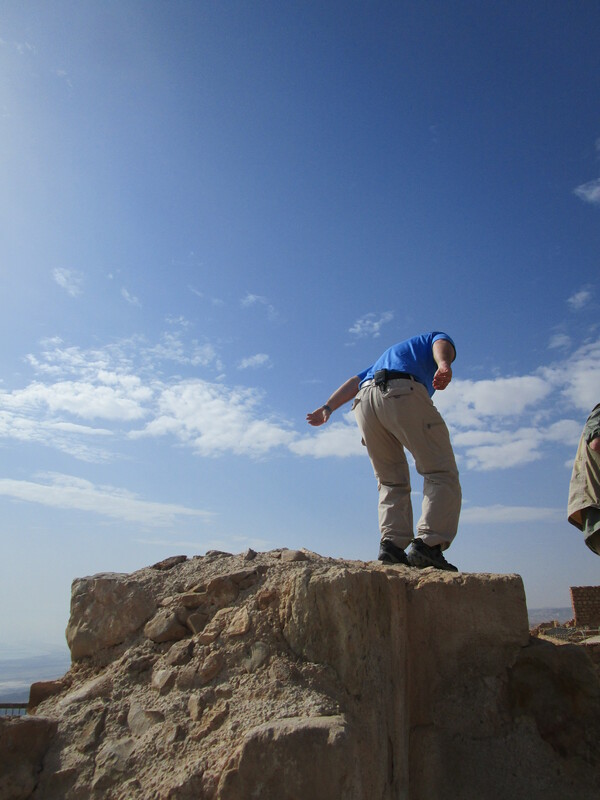 From its top you can see for miles around – the Dead Sea just to the east and the Trans Jordan mountains beyond it, and more of the Judean mountains to north, west, and south. 1 Samuel 23 tells of Saul pursuing David in the wilderness in order to kill him: in fact, verse 14 says that “Saul sought him every day…” chasing him from place to place with a determination that must have been wearying to David. 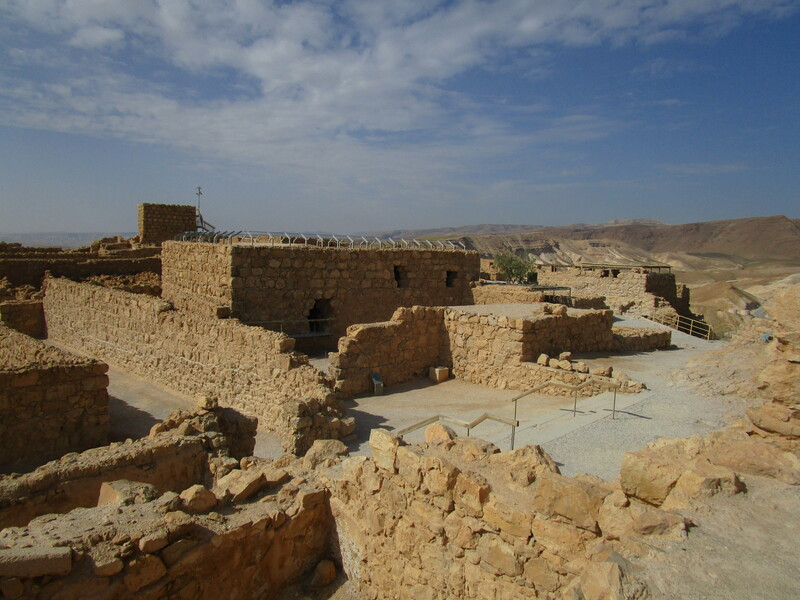 The end of that chapter tells of David living in the “strongholds of Engedi” and chapter 24 says he later ‘went up to the stronghold” – very likely the place we call Masada. 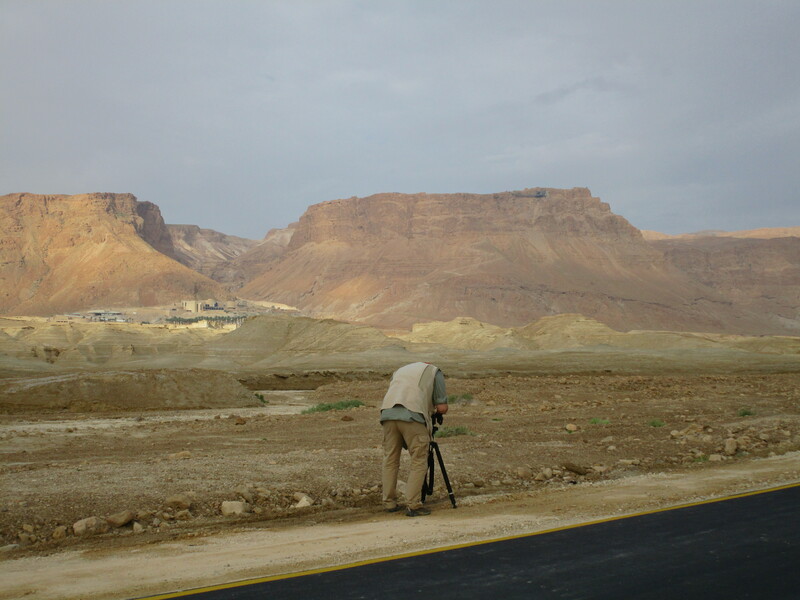 What I am especially loving about this trip – this learning experience – is that I am seeing things that are recorded in scripture, and then seeing with my own eyes the places that are spoken of. Things make sense! The places are real – they’re still here! The Bible is true, and our God is alive and cares about His children! I hope someday all of you can see with your own eyes, as well. 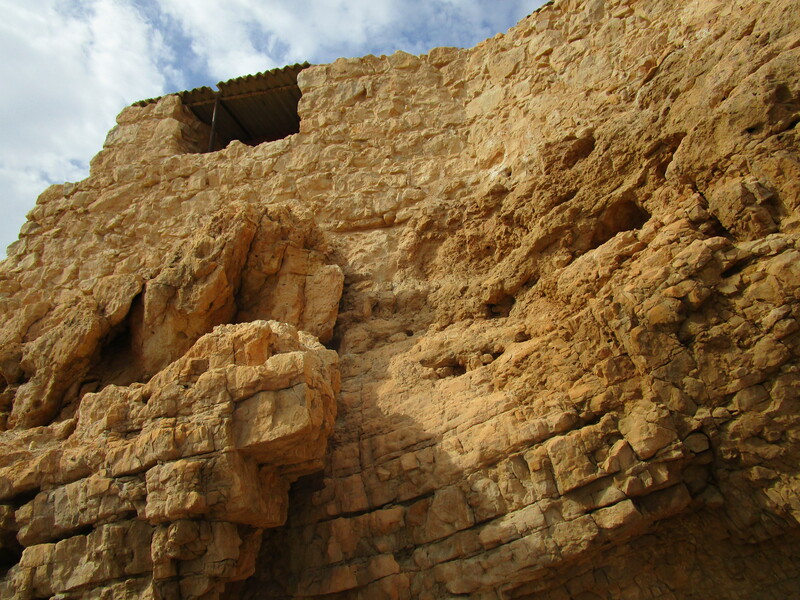 So when I looked at Masada today, I could see in my mind David escaping from Saul to this “fortress”, this “stronghold”, this “rock” – and feeling a sense of security and relief, knowing he could rest without fear of his enemy. And I could see him pouring out his heart in a psalm addressed to his Heavenly Father – likening the earthly stronghold that brought him comfort and peace and strength to the One who gives eternal comfort, peace, and strength. 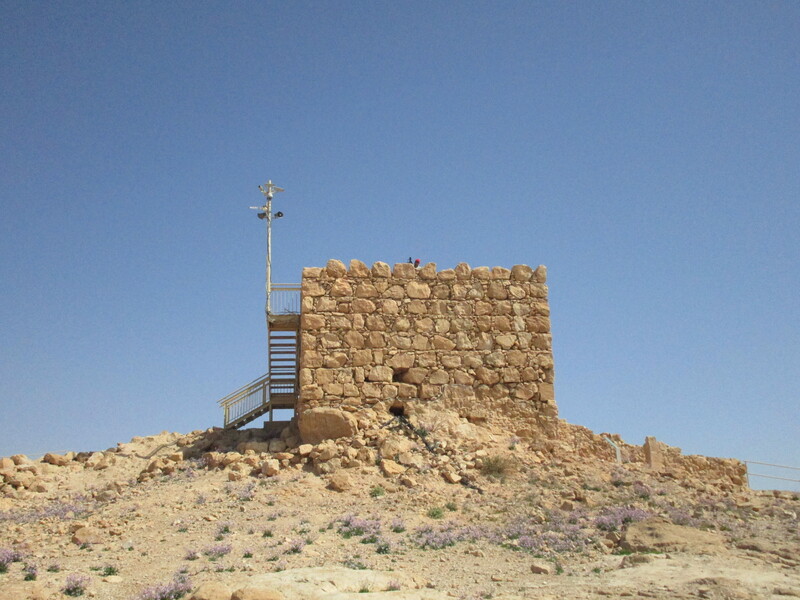 Just as the stronghold of Masada was his rock, his fortress, his deliverer, his refuge, his shield and his salvation from earthly enemies, so God, in a spiritual sense, provided all this and more. Our enemies are likely different today. We aren’t chased by men seeking to kill us. But the enemy – the devil – does chase us, using any means possible to separate us from God. Some things are obvious: money, status, possessions. But others are more opaque: depression, guilt, bitterness, unhappiness, insecurity. Yet God wants to be our fortress, our rock, our strength, and our deliverer. He alone can provide the peace “that passes all understanding” (Phil 4:7). “Come unto me, all who labor and are heavy laden, and I will give you rest,” (Matt. 11:28). David had confidence in God, and so can we. We still can’t seem to sleep past five a.m. and it must have something to do with the early sunrise here. So we are up and moving early, and on to breakfast – and Dewayne arrived during the night! Then out the door of the hotel by 7:30. Can I just reiterate that while we are so excited and thrilled to be here, this is NO relaxing vacation at the spa! We are trying so hard to cram every site into every minute of every day because we want to be wise about our time here. 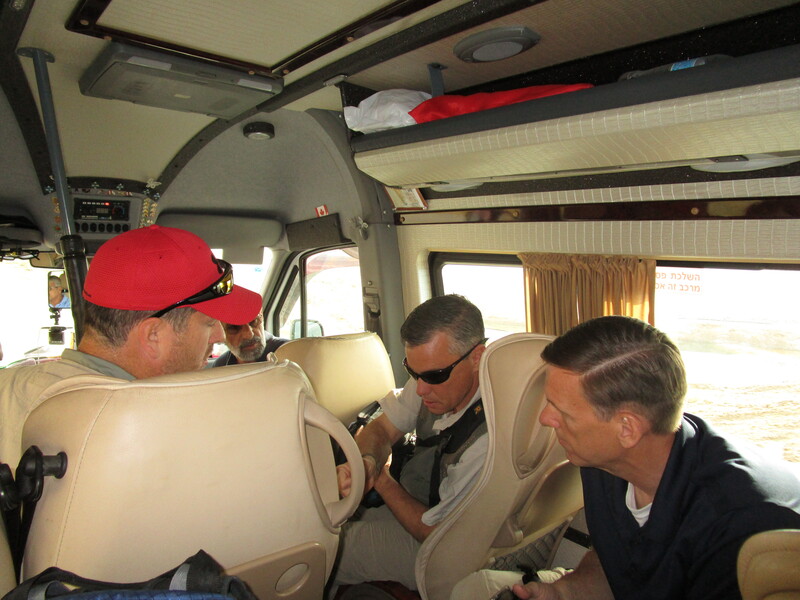 This trip has not been inexpensive – and we know we have a responsibility to the people who trust us. 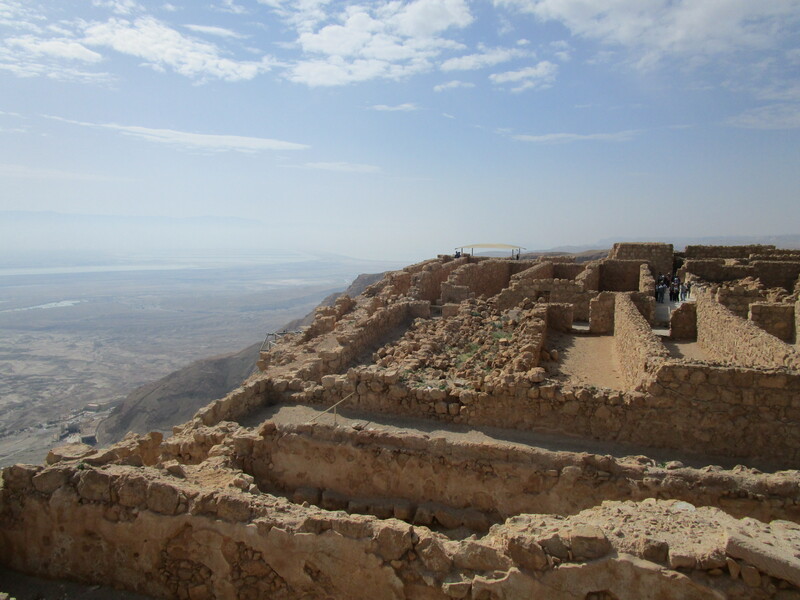 Our first stop, only about 30 minutes from the hotel, was Masada. 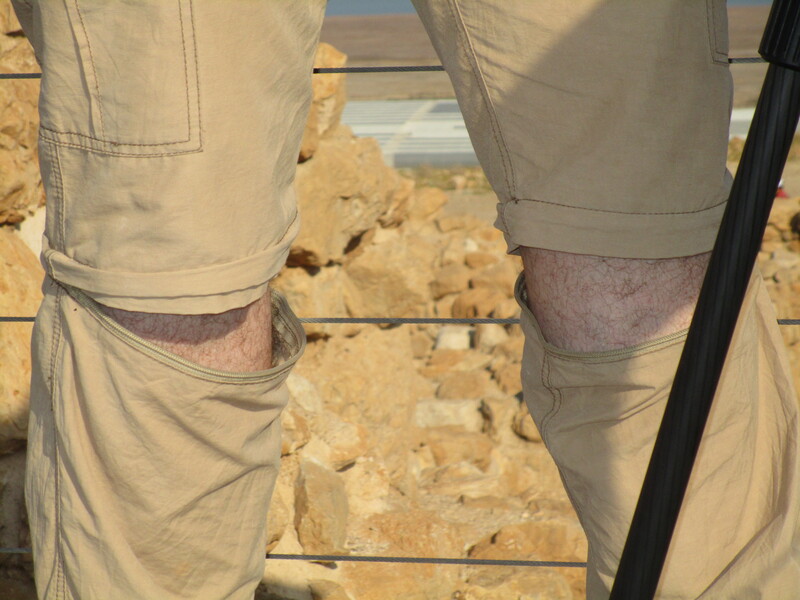 John has been training for months to be able to walk up the snake path to the top. This path snakes back and forth up 700 stairs, for two and half miles up the east face of the mountain. Part of me wanted to hike it with him, but most of me didn’t want to drag him down. Jon climbed with him. Tsvi said, “Ees a nice walk, eef youre in good shape!” Rick, Philip, Gary, Mat, Doug, Dewayne, Micah and I took the cable car to the top so we could knock out some of Gary’s A-roll. The “snake path” below is what John and Jon climbed to get to the top. 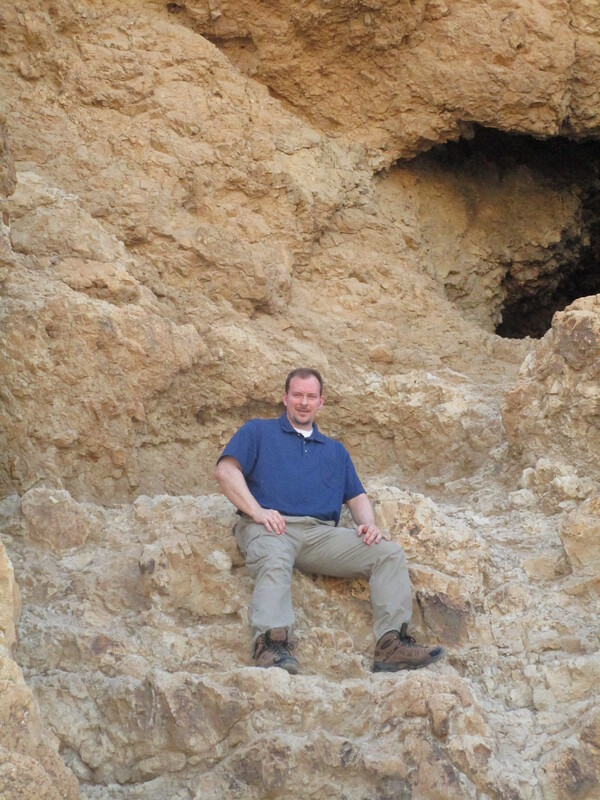 John was wearing a GoPro, so there will be some interesting footage in the lessons concerning Masada and David. But the quick five-minute ride was over before we knew it, and the little girl was proud of herself for making it. 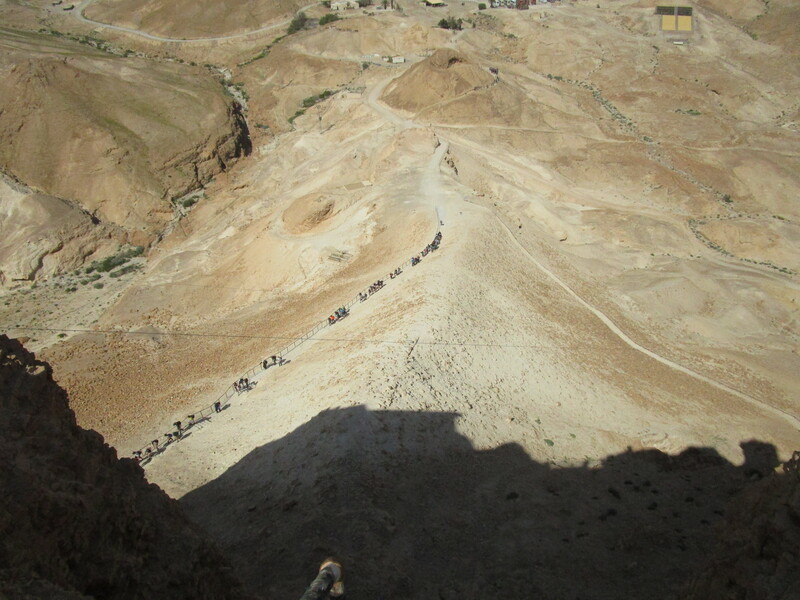 We all piled off of the car and tried to make our way up. 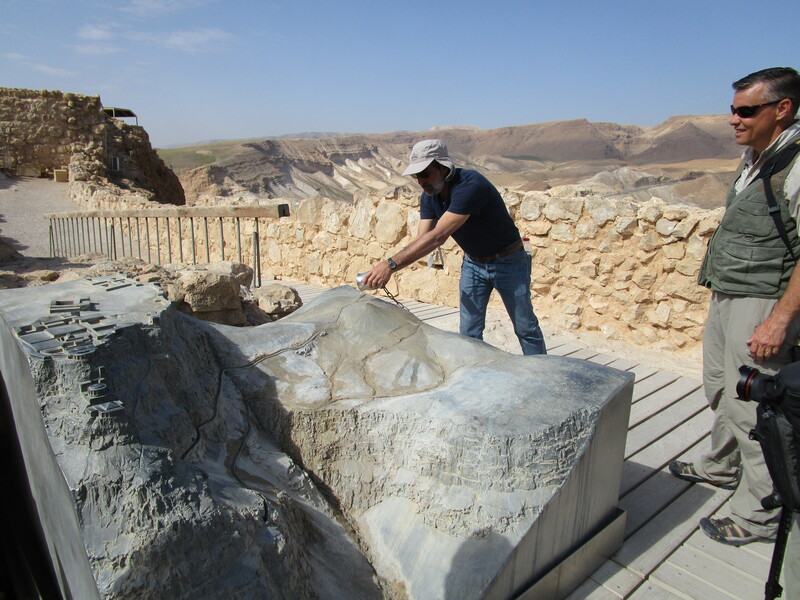 One problem we’ve encountered are the sheer number of people who are touring here in Israel. We hear different languages everywhere we turn. So finding a semi-quiet spot without people gawking at Mat or whoever is in front of the camera (and taking their picture because they think it must be someone famous) can be difficult. 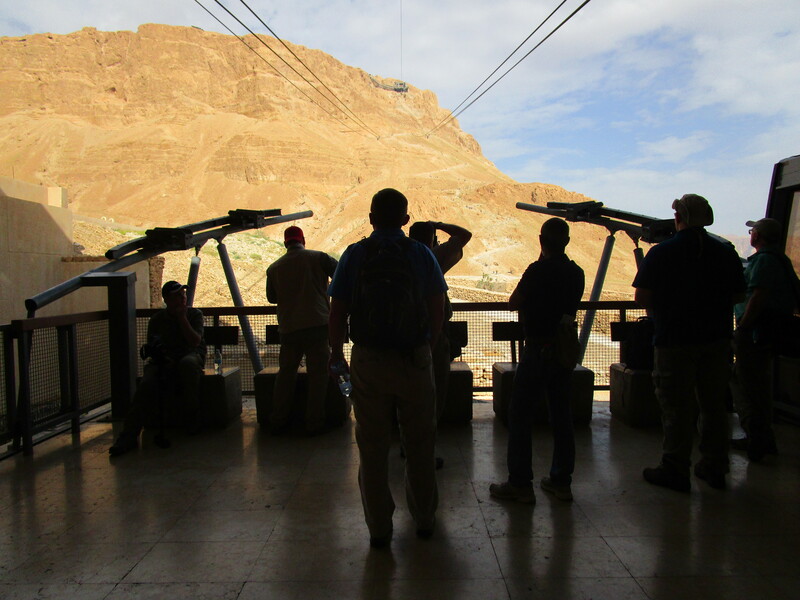 Sometimes we have to wait for a group to clear out before we can proceed, and that was the case with Masada today. 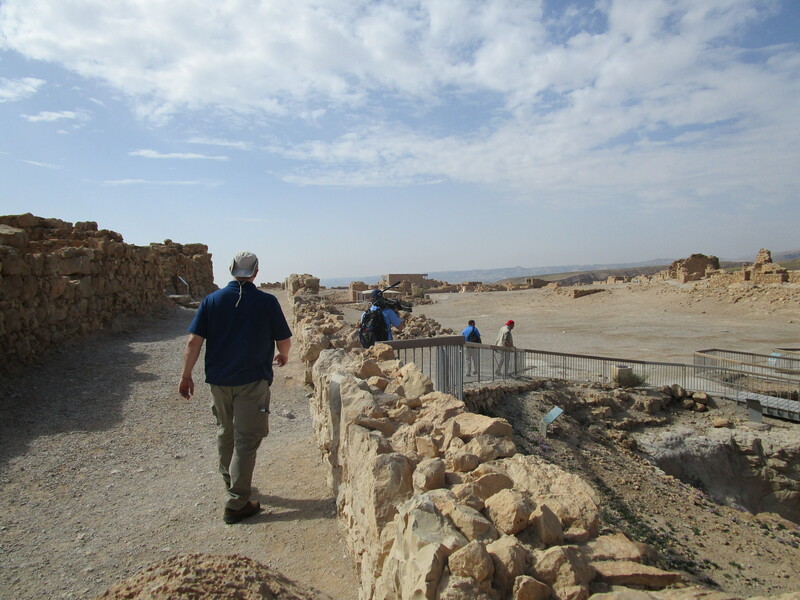 The top of Masada looked to me to be about four football fields together – not end to end, but one next to the other. It is hot (in fact, most of us look like raspberries tonight!) and dry on top. There are ruins to explore and models to learn from. Today there were quite a few schoolchildren sitting in classes here and there. 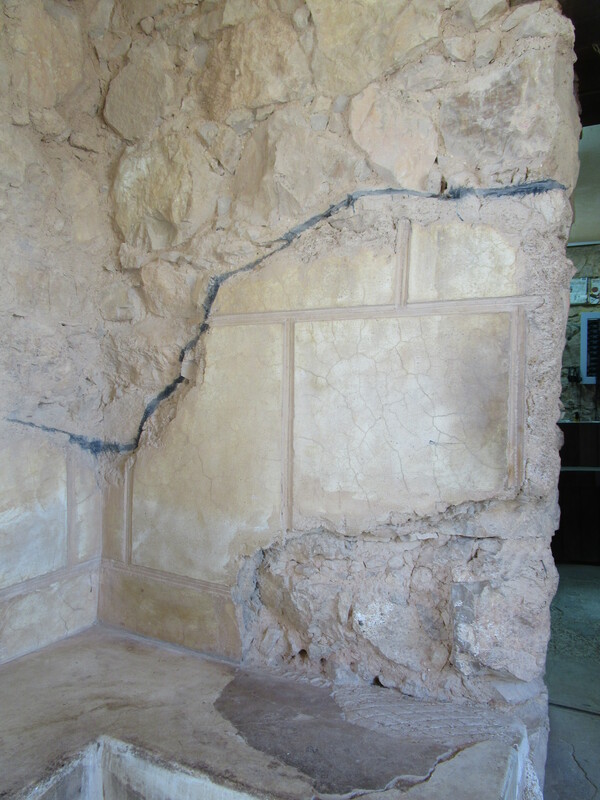 Most of the walls have been rebuilt, but there is a black line that shows where the original material still stood, and they used the rocks that had fallen from the walls to rebuild them. There is a synagogue on top. 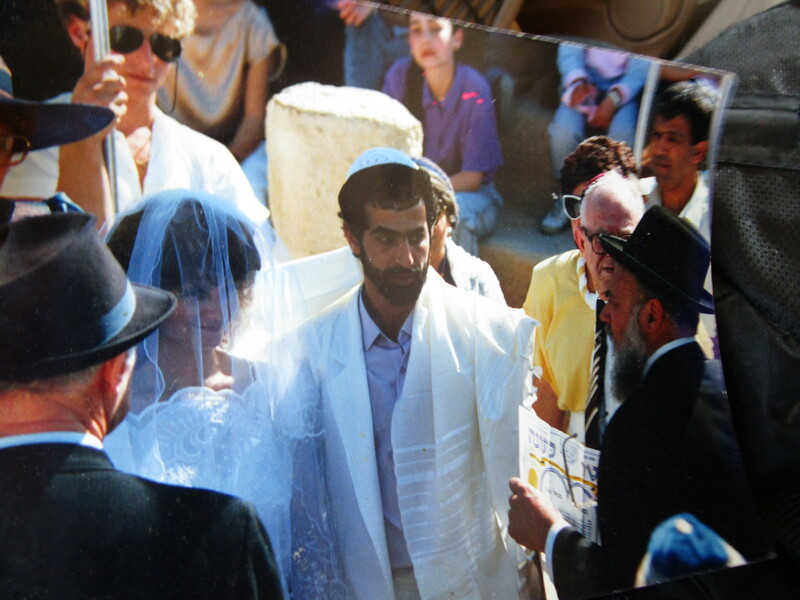 Tsvi and his wife were married there 26 years ago on March 29! 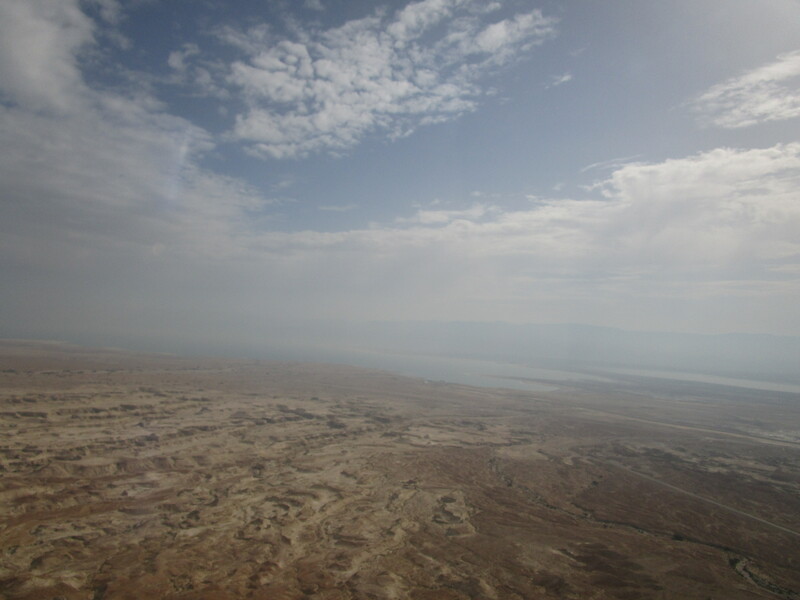 This area of Israel rarely sees rain; in fact, they usually have less than three inches per year. But the acqueduct system is fascinating. Huge cisterns were dug out of stone and a gorge was dammed up to catch floodwater when it came. The water would then be channeled into these huge cisterns. You can read in more detail here. A little model near the cisterns allows you to fill a cup with water and pour the water over the model, which shows how the water flowed downhill into the cisterns. And when you consider the amount of water required to fill the bathhouses, swimming pools, provide baths and drinking water – it’s staggering. 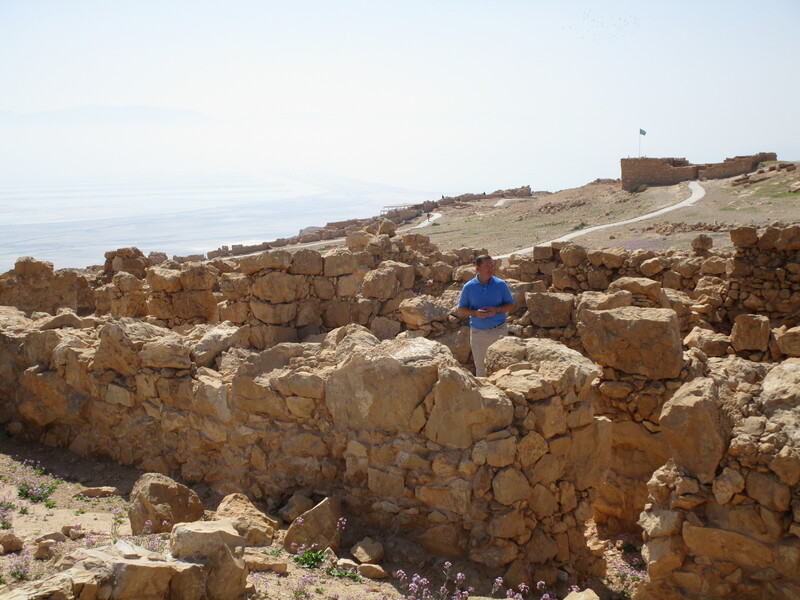 The story of the siege at Masada in about 72 AD is also fascinating. 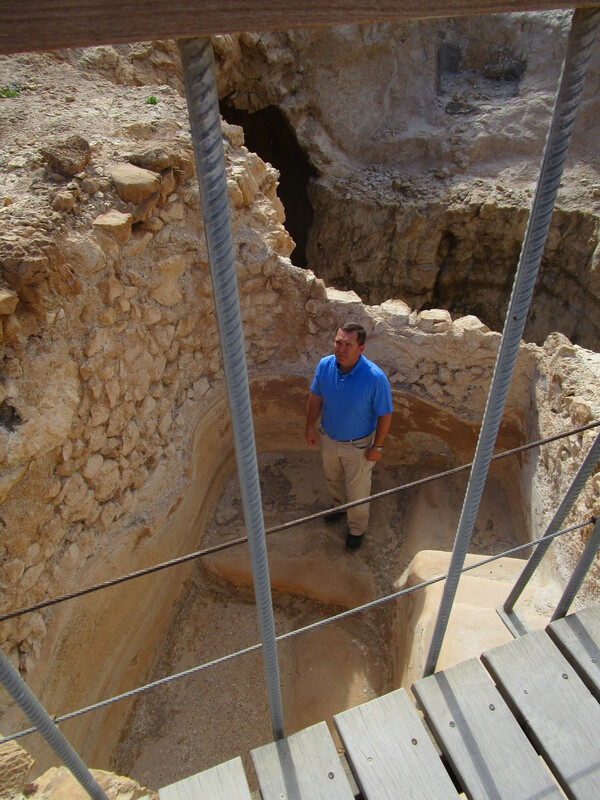 Gary explained how the Romans built up a narrow ridge into a 50 foot ramp leading to the top. 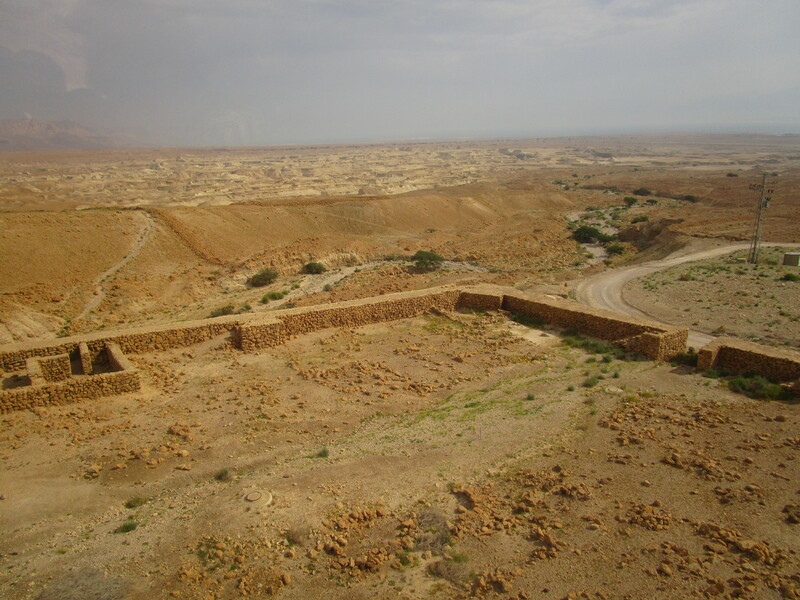 Even though the Jews tried to defend the fortress with all of the weapons they had, the Romans still managed to build a tower atop the ramp with a huge battering ram. 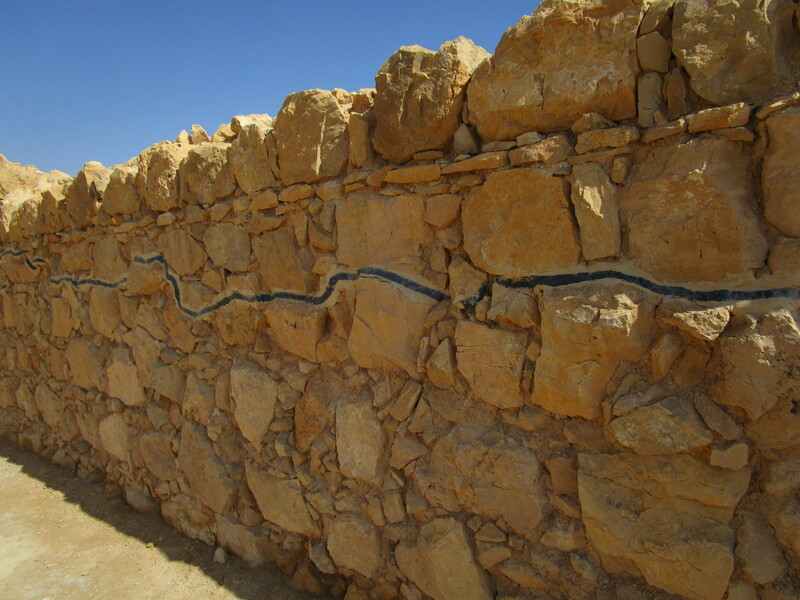 Behind the fortress gate, the Jews built another tall wall of wooden beams, backed by dirt. So when the battering ram went against the wall, it only drove the beams into the earth. The Roman general figured out what the Jews had done, and they then sent flaming arrows into the wooden beams, which caught fire and turned the battle to the Romans. Inside, the 900 drew lots to see who would have to kill each other (rather than be killed by the Romans.) So when the Roman army entered the city, they found only dead bodies, until they found 2 women and 3 small children hiding in a cistern. 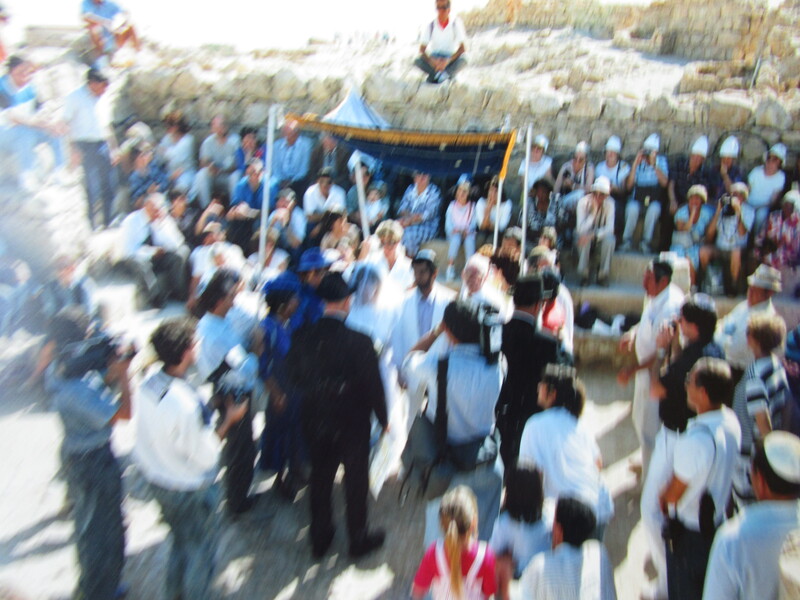 From those five individuals, they learned the details of the siege. I can’t wait to see how this lesson turns out! It has been interesting, too, seeing how each speaker presents his lessons. They have all been fantastic, with each one having a different style of delivery. I think the variety will be even more compelling. 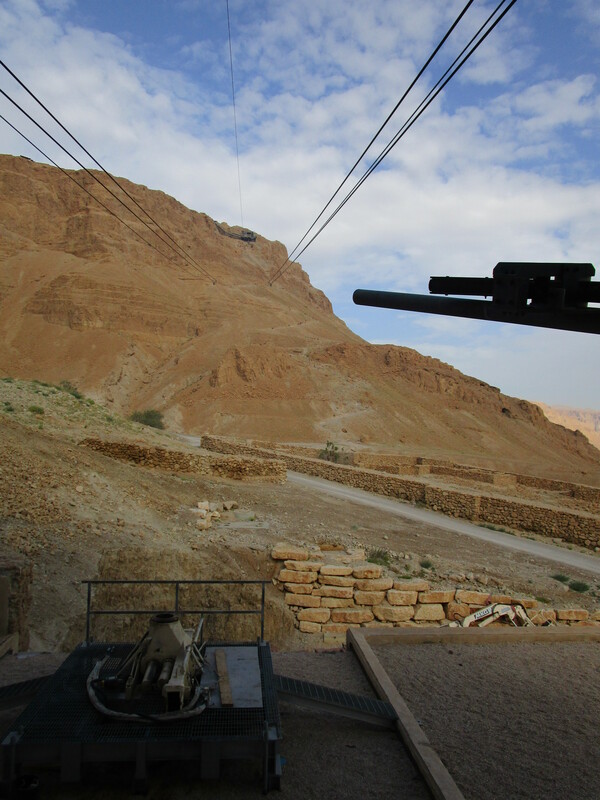 We took the cable car down, which conveniently lands you right in Masada’s gift shop. All kinds of interesting things were there, including the Ahava brand of lotions and soaps, Naot shoes (a super comfortable, super expensive brand native to Israel) and spices. We really have not had any time at all to do a little shopping, but hope to in Jerusalem. 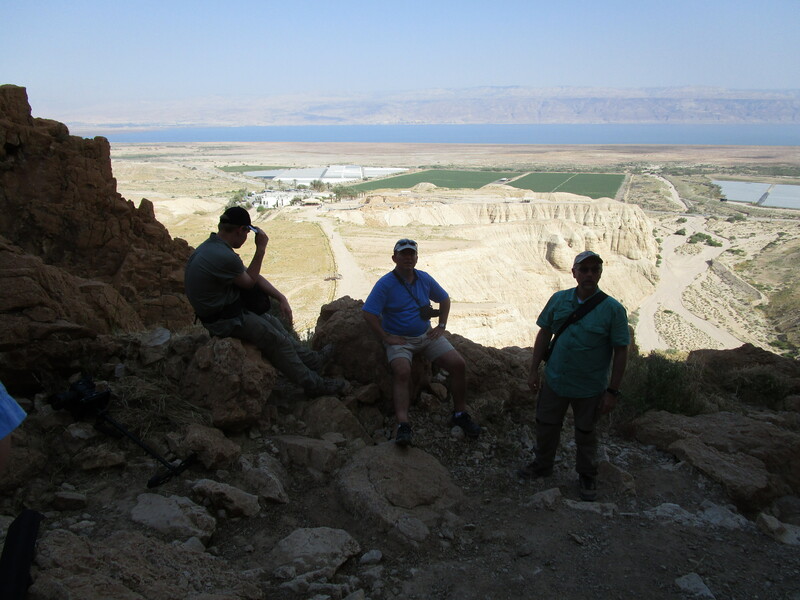 After lunch in the cafeteria there, we jumped back in the van for the fairly quick trip to Ein Gedi. Gedi means springs, or oasis. As you approach the area from the Judean wilderness, you see a group of palm trees and other kinds of trees – a very visible difference from the rest of the area. I thought it was funny, too, how children are the same everywhere. Many of these were probably about eleven or twelve years old. The boys were all pushing, shoving, and strutting around one another. Rick took pictures and they all danced around him, shouting “Instagram! Instagram!” The girls were giggling and staring, coming back from the bathroom together hand in hand, whispering to one another. The head coverings were mostly colorful and patterned, so you could see some “fashion” coming out in their choices. And just like back home, some of the girls (and boys) had their own style; I noticed a few little girls who had baseball caps on top of their head coverings! 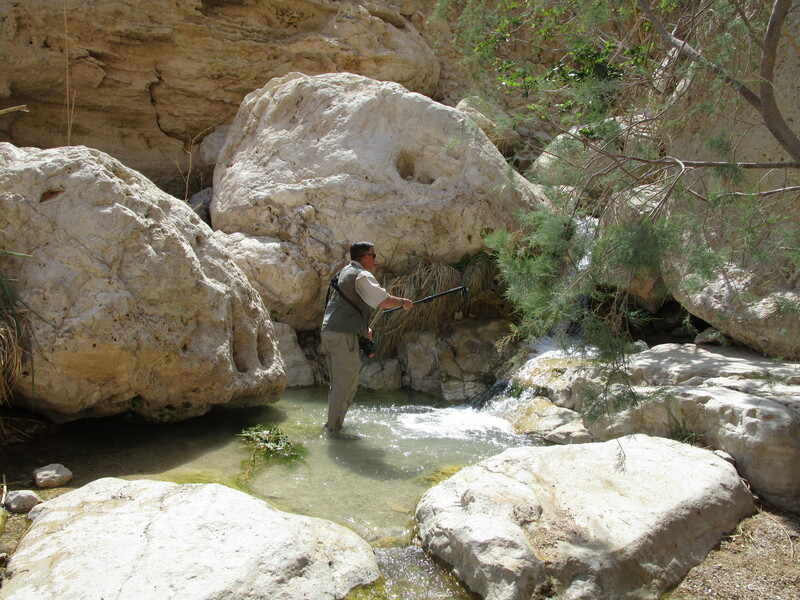 John filmed at Ein Gedi: “Judah, David’s Training Ground of Faith”. 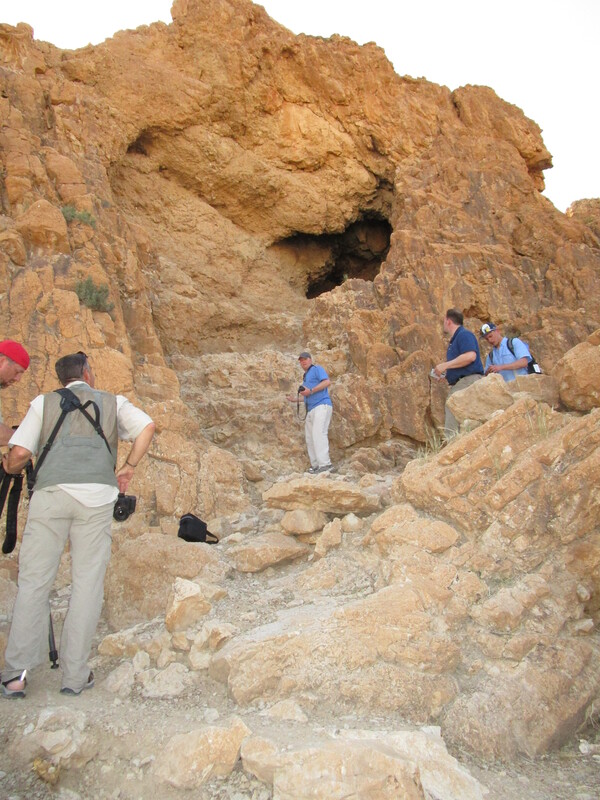 He showed the springs and also found many clefts in rock that would hide a person. It’s going to be great, too! 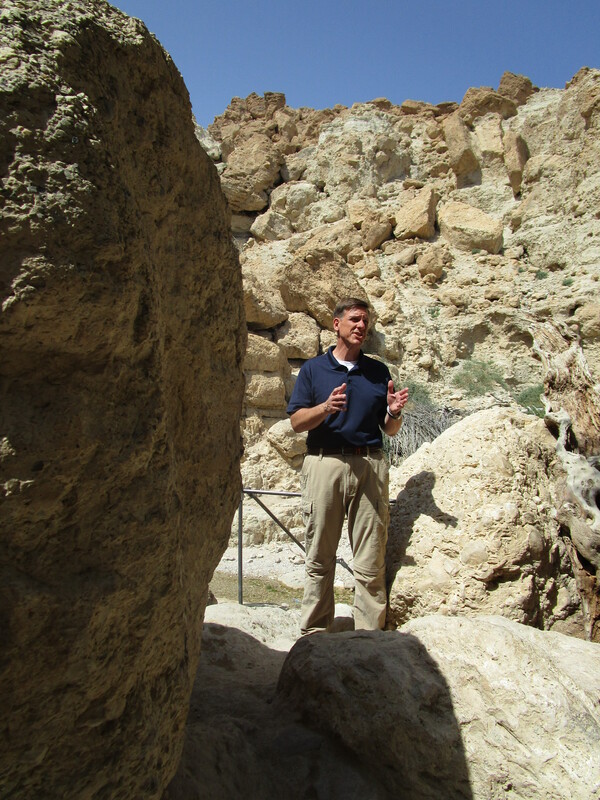 Then we headed out to Qumran, where Dewayne filmed his first segments about the Dead Sea Scrolls. We did a LOT of climbing today. (My Fitbit tells me I’ve walked almost 50 miles in the last week!) 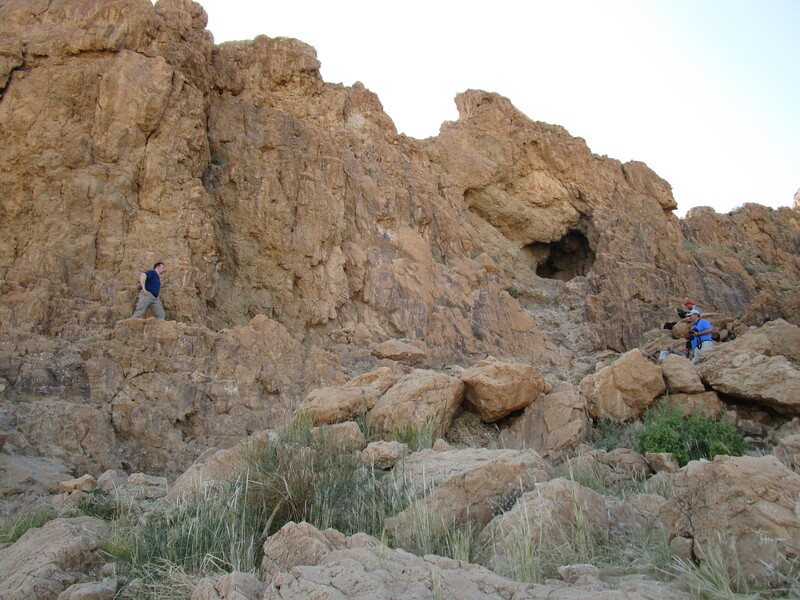 We all climbed up to the one semi-accessible cave. 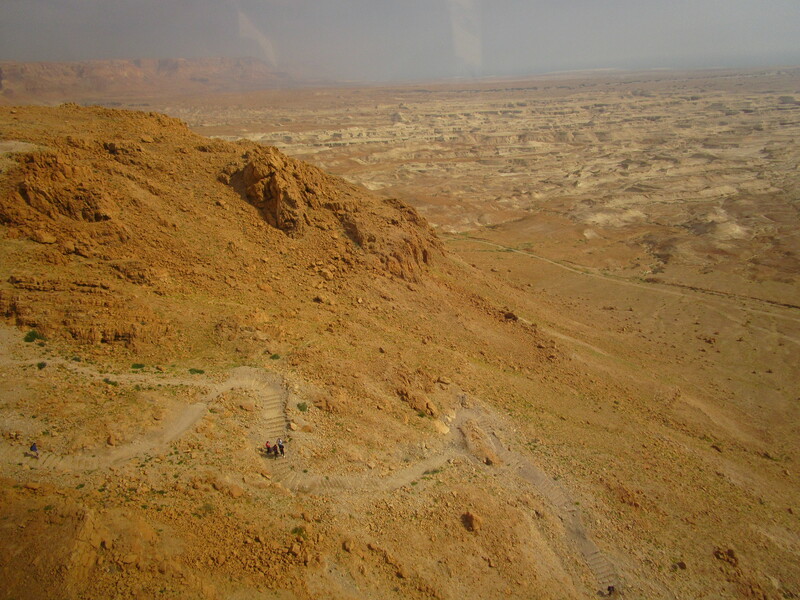 It was not how I’d pictured it in my mind…Qumran is just next to the Dead Sea, not in the middle of nowhere as I’d imagined. I’m sure it was even more desolate back in the first century. The guys have adopted a new fashion statement. This is the FIRST night of the trip that we arrived at the hotel by 5:00 p.m. and it’s been great to have a little chill time tonight! Some of our group walked down and floated in the Dead Sea. John and I were too tired and had things to work on in the hotel room, so we didn’t walk down there. We had supper in the dining room at the hotel. This hotel is so very diverse. Many, many older women in long hoods. Many more head coverings here than in the previous two places we’ve stayed. But no one looks at me the least bit differently because my head isn’t covered. It has been quite an experience. Thanks for letting me keep you up to date! 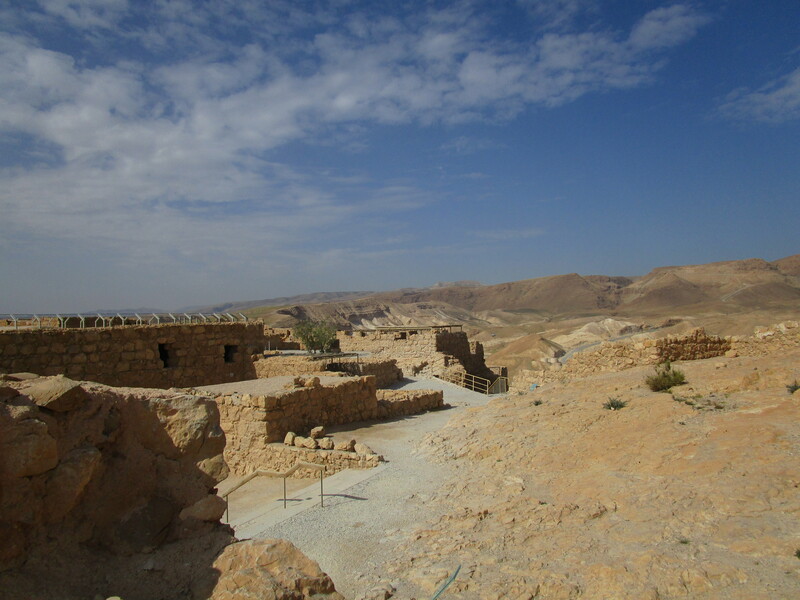 Tomorrow: Tel Arad and Beersheba in the Negev Basin, then to Lachish, and then we will make our way to Jerusalem, where we will stay for the final week. Can’t wait! Meeting of the minds on the bus! Next Let Me Tell You About Three Tels! 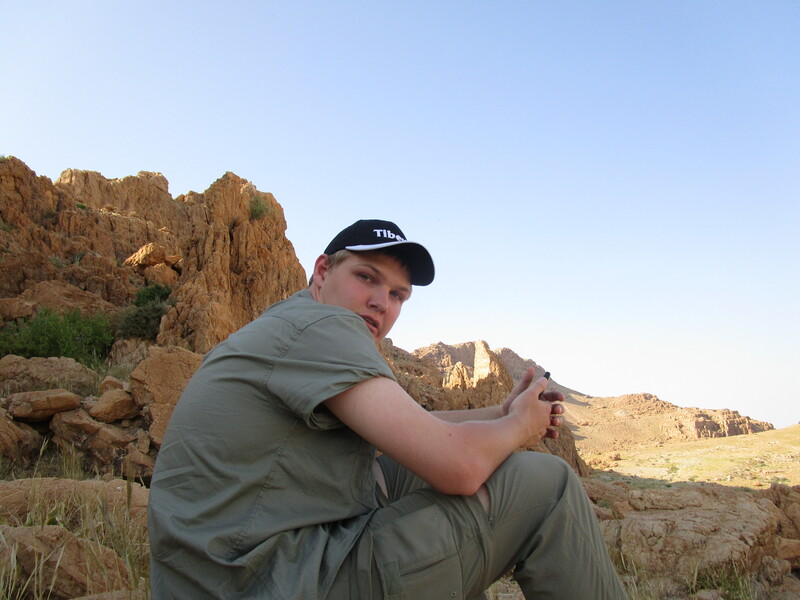 Carla,I hope that this diary and your pictures will be published, as a stand alone journal telling the story of a woman’s thoughts and feelings during a tour of these lands. Thank you so much Carla. 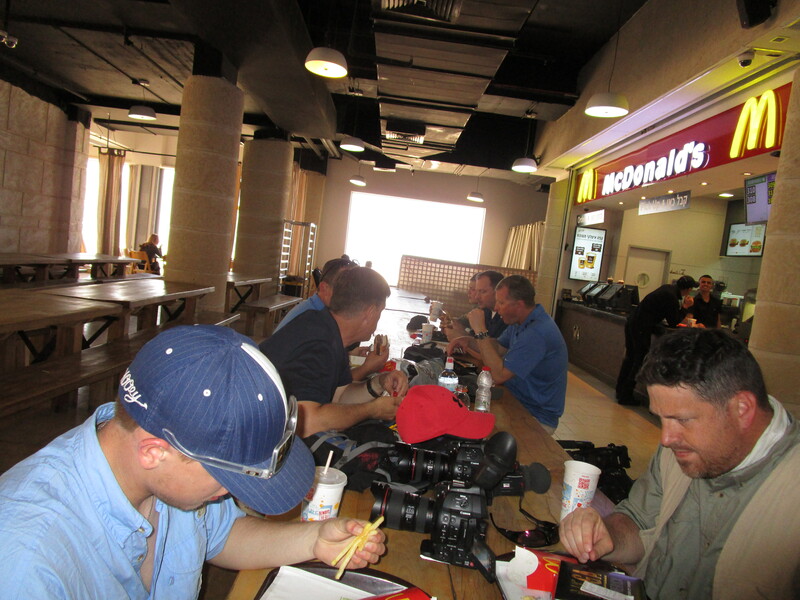 Can’t tell you how much this journal of your travels has encouraged all of us who are keeping up with this trip.